last night, we attended two events: estée lauder's launch of two new products at M café and the formal opening of glorietta 5. and it was raining—hard—the entire time, from the minute we left the office at 6pm to when we got to M café, then left to go to G5, then went home. going to M café is not the easiest thing. your only access by car is on makati avenue, and between maneuvering all those U turns and the one-way direction (the opposite direction, that is) of de la rosa street, not to mention the rain, you better give yourself a lotta time to make it on time. the best way to get there? if you just need to be dropped off, drive into the underground parking lot and get off by the escalator or staircase that leads up to M café. do this all within the 15-minute grace period, then the car can drive out of the parking lot without having to pay for parking. that's what we did. 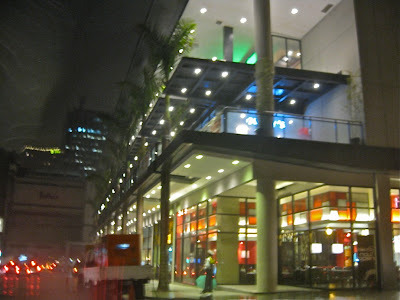 pero nabasa pa rin kami kasi the awnings are not long and wide enough noh. 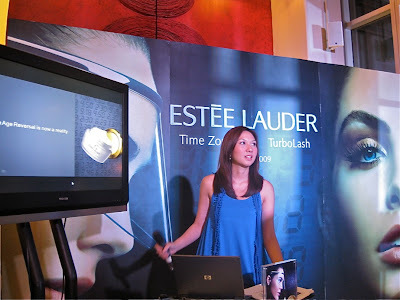 anyhoo, estée lauder launched two new products, time zone moisturizer and turbolash mascara. the latter is a curious little product as the wand vibrates when you take it out of the tube. ooh egg-ziting... some naughty editors even joked that the vibration wasn't strong enough and the tube wasn't long and wide enough, tee-hee ;-) then we left for G5, which, when it's raining, even with a car and driver, is not easy to get to either. it was still raining parks and wildlife (stronger than cats and dogs, haha, right, rache? :-) so where do you get off and enter the mall without getting wet?? we went around and finally found the awning on the intercon side, but it still wasn't long and wide enough that the water doesn't cascade on you. plus there were orange cones blocking part of it! hello, mister guards, are you preventing people from going to your boss's mall?? haaay! the things we do to support potential advertisers na hindi naman nag-a-advertise! raining parks and wildlife! iLove! i totally agree. neither malls are kid friendly at all. try going around there with a stroller. Architecture is fabulous but out of context. we live in the tropics where it rains half the year. Now with climate change, even more. "The things we do to support potential advertisers na hindi naman nag-a-advertise!" LOL!! Oo nga!